Neuronal loss in Alzheimer's or prion diseases is preceded by the accumulation of fibrillar aggregates of toxic proteins (amyloid-β1-42 or the prion protein). Since some epidemiological studies have demonstrated that the EGb 761 extract, from the leaves of the Ginkgo biloba tree, has a beneficial effect on Alzheimer's disease, the effect of some of the major components of the EGb 761 extract on neuronal responses to amyloid-β1-42, or to a synthetic miniprion (sPrP106), were investigated. Components of the EGb 761 extract were tested in 2 models of neurodegeneration. SH-SY5Y neuroblastoma cells were pre-treated with ginkgolides A or B, quercetin or myricetin, and incubated with amyloid-β1-42, sPrP106, or other neurotoxins. After 24 hours neuronal survival and the production of prostaglandin E2 that is closely associated with neuronal death was measured. In primary cortical neurons apoptosis (caspase-3) in response to amyloid-β1-42 or sPrP106 was measured, and in co-cultures the effects of the ginkgolides on the killing of amyloid-β1-42 or sPrP106 damaged neurons by microglia was tested. Neurons treated with ginkgolides A or B were resistant to amyloid-β1-42 or sPrP106. Ginkgolide-treated cells were also resistant to platelet activating factor or arachidonic acid, but remained susceptible to hydrogen peroxide or staurosporine. The ginkgolides reduced the production of prostaglandin E2 in response to amyloid-β1-42 or sPrP106. In primary cortical neurons, the ginkgolides reduced caspase-3 responses to amyloid-β1-42 or sPrP106, and in co-culture studies the ginkgolides reduced the killing of amyloid-β1-42 or sPrP106 damaged neurons by microglia. Nanomolar concentrations of the ginkgolides protect neurons against the otherwise toxic effects of amyloid-β1-42 or sPrP106. The ginkgolides also prevented the neurotoxicity of platelet activating factor and reduced the production of prostaglandin E2 in response to platelet activating factor, amyloid-β1-42 or sPrP106. These results are compatible with prior reports that ginkgolides inhibit platelet-activating factor, and that platelet-activating factor antagonists block the toxicity of amyloid-β1-42 or sPrP106. The results presented here suggest that platelet-activating factor antagonists such as the ginkgolides may be relevant treatments for prion or Alzheimer's diseases. The symptoms of Alzheimer's disease (AD), or the transmissible spongiform encephalopathies, otherwise known as the prion diseases, are thought to arise after the dysfunction or degeneration of neurons. In these diseases, extracellular aggregates of insoluble, misfolded, fibrillar proteins are thought to cause the neuronal damage. In AD, fibrils consisting of amyloid-β peptides are formed following the cleavage of the amyloid precursor protein by γ-secretases . In the prion diseases the cellular prion protein (designated PrPC) is converted into a disease-related isoforms (PrPd), in a process whereby a portion of the α-helix and random coil structure in PrPC is refolded into a β-pleated sheet . Standard techniques to study the mechanisms of neuronal loss in vitro include incubating neuronal cells with peptides derived from the PrP protein  or from amyloid-β . The neuronal injury induced by these peptides include events characteristic of apoptosis such as surface blebbing, chromatin condensation and DNA fragmentation . In the present study we examined the neurotoxicity of fibrillar peptides by exposing the SH-SY5Y neuroblastoma cell line, or murine primary cortical neurons, to amyloid-β1-42, to a peptide derived from the human PrP protein (HuPrP82-146), or to a synthetic murine "miniprion" (sPrP106) . Further studies examined the interactions between amyloid-β1-42 or sPrP106 damaged neurons and microglia. Extracts from the leaves of the Ginkgo biloba tree are becoming increasingly popular as a treatment that is claimed to reduce memory loss and the symptoms of mild cognitive disorders including AD. However, there remains considerable debate regarding the mechanisms of action of these preparations, or even whether such preparations have any clinical benefit. While some published studies conclude that the use of a standardized extract of the leaves of the Ginkgo biloba tree (EGb 761) reduces the symptoms of mild cognitive disorders including AD [6–8], more recent studies have failed to show clinical benefit with other preparations . In tissue culture studies the EGb 761 extract reduces amyloid-β aggregation and caspase-3 activity , and protects hippocampal neurons against amyloid-β . Since the EGb 761 extract contains many compounds including ginkgolides and the flavonoglycosides myricetin or quercetin, it is not clear which of these compounds provide the protective effect. In the present study, the main components of the EGb 761 extract were examined for their effects on SH-SY5Y neuroblastoma cells, primary cortical neurons and microglia. Low concentrations of the ginkgolides A or B were shown to protect neurons against PrP peptides or amyloid-β1-42, and to reduce microglial killing of damaged neurons. The human neuroblastoma SH-SY5Y cell line (European Collection of Cell Cultures) was grown in RPMI-1640 culture medium supplemented with 2 mM glutamine, 100 U/ml penicillin, 100 μg/ml streptomycin and 5% foetal calf serum (FCS). Cells were plated at 5 × 104 cells/well into 96 well plates and allowed to adhere overnight before use. Cells were pre-treated with test compounds for 3 hours before the addition of peptides and 24 hours later the survival of neurons was determined by treating cultures with WST-1 from Roche Diagnostics Ltd (Lewes, UK) for 3 hours. The amount of dye formed correlates to the number of metabolically active cells. Optical density was read on a spectrophotometer and percentage survival was calculated by reference to untreated cells incubated with WST-1 (100%). To measure prostaglandin E2 production SH-SY5Y cells were plated at 5 × 105 cells/well in 24 well plates and allowed to adhere overnight before use. Cells were treated with test compounds for 3 hours before the addition of peptides and 24 hours later prostaglandin E2 levels were determined using a competitive enzyme immunoassay kit (Amersham Biotech, UK) according to the manufacturer's instructions. Primary cortical neurons were prepared from embryonic brains as previously described . After 24 hours media was changed to neurobasal medium containing B27 components (NBM) (Invitrogen, Paisley, UK) and 2 mM glutamine. Mature cultures were pre-treated with test compounds for 3 hours before the addition of peptides; caspase-3 activity was measured using a flourometric immunosorbent enzyme assay (FIENA) kit as per the manufacturer's instructions (Roche Diagnostics, Lewes, UK) 24 hours later. For cell survival assays, microglia (prepared by dissociating the cerebral cortices of newborn 129/Ola mice as previously described ) were added to peptide treated neuronal cultures in the ratio of 1 microglia to 10 neuronal cells. Medium was replaced after 48 hours, and after 4 days microglia were removed by shaking (260 r.p.m for 30 minutes). The survival of neurons was then determined by treating cultures with WST-1. Peptides containing amino acid residues 82 to 146 of the human PrP protein (HuPrP82-146), a control peptide (HuPrP82-146 scrambled), and a synthetic miniprion (sPrP106) derived from the murine PrP sequence were used. A peptide containing amino acids 1 to 42 of the amyloid-β protein (amyloid-β1-42) and a control peptide (amyloid-β42-1) were obtained from Bachem (St Helens, UK). Ginkgolide B, myricetin, quercetin, staurosporine, arachidonic acid, platelet-activating factor (PAF) and hydrogen peroxide were obtained from Sigma (Poole, UK). Ginkgolide A was obtained from Calbiochem (Nottingham, UK). Comparison of treatment effects were carried out using one and two way analysis of variance techniques as appropriate. Post hoc comparisons of means were performed as necessary. SH-SY5Y cells were pre-treated with the ginkgolides A or B, or with the flavonoglycosides, myricetin or quercetin (at concentrations which did not affect the growth rate or survival of these cells) before the addition of 5 μM sPrP106, 10 μM HuPrP82-146 or 10 μM amyloid-β1-42. The survival of cells pre-treated with 1 μM ginkgolide A and incubated with sPrP106, HuPrP82-146 or amyloid-β1-42 was significantly higher than that of untreated cells incubated with these peptides. Cells pre-treated with 1 μM ginkgolide B were also resistant to the otherwise toxic effects of 5μM sPrP106, 10 μM HuPrP82-146 or 10 μM amyloid-β1-42. Pre-treatment of cells with 25 μM myricetin, or 25 μM quercetin, did not affect the toxicity of sPrP106, HuPrP82-146 or amyloid-β1-42 (Table 1). The survival of cells was not affected by the control peptides HuPrP82-146 scrambled or amyloid-β42-1 (data not shown). Ginkgolide-treated SH-SY5Y cells are resistant to PrP peptides/amyloid-β1-42: The survival of SHSY-5Y cells in control medium, medium containing 1 μM ginkgolides A, 1 μM ginkgolide B, 25 μM myricetin or 25 μM quercetin for 3 hours and subsequently incubated for 24 hours with 5 μM sPrP106, 10 μM HuPrP82-146 or 10 μM amyloid-β1-42. Values shown represent the percentage survival of cells compared to untreated cells. Each value is the mean ± SD from triplicate experiments repeated four times (12 observations). 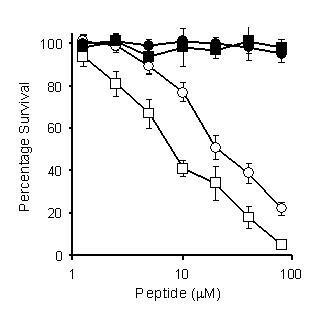 ** = Cell survival significantly greater (p < 0.05) than cells incubated with peptides in the absence of drugs. In further studies cells were pre-treated with different concentrations of the ginkgolides prior to the addition of 20 μM amyloid-β1-42. 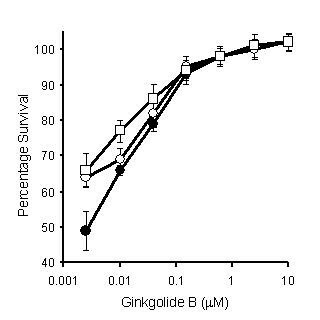 Pre-treatment with ginkgolides A or B resulted in a dose-dependent increase in neuronal survival (Fig 1). At concentrations less than 1 μM, the survival of cells treated with ginkgolide B was significantly greater than that of cells treated with ginkgolide A. Pre-treatment with ginkgolide B also resulted in a dose-dependent increase in neuronal survival in response to 5 μM sPrP106 or 10 μM HuPrP82-146, as well as to 10 μM amyloid-β1-42 (Fig 2). Ginkgolides protect neurons against amyloid-β 1-42 : The survival of SH-SY5Y cells pre-treated with different concentrations of ginkgolide A (shaded circles) or ginkgolide B (open circles) for 3 hours, and thereafter incubated with 20 μM amyloid-β1-42. Cell survival was measured 24 hours later using the WST-1 method. Each value represents the mean percentage cell survival ± SD from triplicate experiments repeated four times (12 observations). 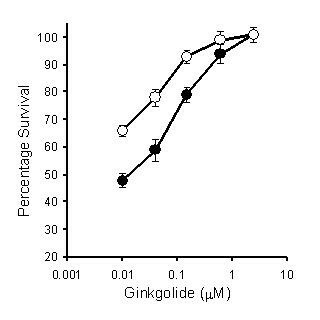 Ginkgolide B protects neurons against amyloidogenic peptides: The survival of SH-SY5Y cells pre-treated with different concentrations of ginkgolide B for 3 hours and thereafter incubated with 5 μM sPrP106 (open squares), 10 μM HuPrP82-146 (open circles) or 20 μM amyloid-β1-42 (shaded circles). Cell survival was measured 24 hours later using the WST-1 method. Each value represents the mean percentage cell survival ± SD from triplicate experiments repeated four times (12 observations). To determine if the protective effect of ginkgolide B could be overcome by increasing the concentration of toxic peptides, different concentrations of amyloid β1-42 or sPrP106 were added to untreated SH-SY5Y cells or to cells pre-treated with 1 μM ginkgolide B. Both amyloid β1-42 and sPrP106 caused a dose-dependent reduction in the survival of untreated cells, however, even high concentrations of amyloid β1-42 or sPrP106 (80 μM) did not reduce the survival of cells treated with 1 μM ginkgolide B (Fig 3). The protective effect of ginkgolide B is non-competitive: Untreated SH-SY5Y cells were incubated for 24 hours with different concentrations of amyloid-β1-42 (open circles) or sPrP106 (open squares). Cells pre-treated for 3 hours with 1 μM ginkgolide B were subsequently incubated for 24 hours with different concentrations of amyloid-β1-42 (closed circles) or sPrP106 (closed squares). Cell survival was measured 24 hours later using the WST-1 method. Each point represents the mean ± SD from triplicate experiments repeated 4 times (12 observations). The toxicity of PrP peptides requires the activation of phospholipase A2 and the subsequent release of neurotoxins such as arachidonic acid and PAF . To determine if ginkgolides blocked the activity of such neurotoxins, SH-SY5Y cells were pre-treated with 1 μM ginkgolide B, and subsequently exposed to different concentrations of hydrogen peroxide, arachidonic acid, PAF or staurosporine. Pre-treatment with ginkgolide B did not affect the survival of cells subsequently incubated with hydrogen peroxide or staurosporine, but did significantly increase cell survival in cultures exposed to PAF or arachidonic acid (Table 2). Ginkgolide B-treated SH-SY5Y cells are resistant to PAF or arachidonic acid: The survival of untreated cells, and cells treated with 1 μM ginkgolide B, subsequently incubated with different neurotoxins at the concentrations shown. Values shown represent the percentage survival of treated cells compared to untreated cells. Each value is the mean ± SD from triplicate experiments repeated three times (9 observations). ** = Cell survival significantly greater (p < 0.05) than untreated cells incubated with neurotoxin. The activation of cyclo-oxygenases (COX) and the production of prostaglandin E2 by amyloid-β1-42 or PrP peptides is an essential step in the process that leads to neuronal loss in SH-SY5Y cells [14, 15]. In the present studies, we were unable to detect prostaglandin E2 in untreated cells or cells incubated with control peptides. Levels of prostaglandin E2 were significantly raised in cells treated with 10 μM HuPrP82-146, 10 μM amyloid-β1-42, 10 μM arachidonic acid or 5 μM PAF. The production of prostaglandin E2 in response to HuPrP82-146 or amyloid-β1-42 was reduced in cells that had been pre-treated with ginkgolides. It addition, pre-treatment with ginkgolides also reduced prostaglandin E2 production following the addition of arachidonic acid or PAF (Table 3). Pre-treatment of cells with myricetin or quercetin did not affect prostaglandin E2 production. The ginkgolides did not affect conversion of arachidonic acid to prostaglandin E2 in cell free systems (neuronal microsomes) showing that (in contrast to aspirin or ibuprofen) they did not have a direct effect on COX (data not shown). Ginkgolides reduce prostaglandin E2 production: Levels of prostaglandin E2 produced by untreated SH-SY5Y cells, or cells pre-treated with 1 μM ginkgolide A, 1 μM ginkgolide B, 25 μM myricetin or 25 μM quercetin and thereafter incubated for 24 hours with 10 μM arachidonic acid, 10 μM amyloid-β1-42 10 μM HuPrP82-146 or 5 μM PAF. Each value is the mean level of prostaglandin E2 (pg/ml) ± SD from triplicate experiments repeated three times (9 observations). ** = Prostaglandin E2 production significantly less (p < 0.05) than in untreated cells. Cellular lysates were prepared from primary cortical neurons incubated with 5 μM sPrP106 or 10 μM amyloid-β1-42 and tested for caspase-3 activity as a measure of apoptosis. Caspase-3 activity in cells treated with sPrP106 (6.9 ± 1.1 AFC units, n = 6) was significantly reduced by pre-treatment with 1 μM ginkgolide B (1.2 ± 1.3, p < 0.05). Similarly, pre-treatment with 1 μM ginkgolide B reduced the caspase-3 activity of neurons incubated with amyloid-β1-42 (5.7 ± 1.2 v 1.5 ± 0.5, p < 0.05). Pre-treating cells with myricetin or quercetin did not alter caspase-3 activity. In further studies primary cortical neurons treated with 1 μM ginkgolide B were resistant to the toxicity of sPrP106 or amyloid-β1-42 (data not shown). Previous studies have shown that microglia kill neurons damaged by PrP peptides  or by amyloid-β . In the present study, primary cortical neurons were pre-treated with ginkgolides for 3 hours prior to the addition of 5 μM sPrP106 and then, after a further 3 hours, microglia. The survival of neurons in co-cultures containing sPrP106 and 1 μM ginkgolide A or 1 μM ginkgolide B was significantly higher than that of untreated neurons or neurons incubated with 25 μM quercetin or 25 μM myricetin and 10 μM sPrP106. Similarly, the survival of neurons in co-cultures containing 10 μM amyloid-β1-42 and 1 μM ginkgolide A or 1 μM ginkgolide B was significantly higher than that of untreated neurons or neurons incubated with 25 μM quercetin or 25 μM myricetin and 10 μM amyloid-β1-42 (Fig 4). Ginkgolides protect sPrP106 or amyloid-β damaged neurons against microglia. Primary cortical neurons were pre-treated with control medium (Con), with 1 μM ginkgolide A, with 1 μM ginkgolide B, with 25 μM quercetin (Quer) or with 25 μM myrecetin (Myr) for 3 hours were then incubated with 5 μM sPrP106 (open squares) or 10 μM amyloid-β1-42 (shaded bars). Neuronal survival was determined 4 days later after the removal of microglia using the WST-1 assay. Values shown represent the percentage survival of treated cells compared to untreated cells. Each point represents the mean ± SD from triplicate experiments repeated 4 times (12 observations). In the present study the affects of individual components of the EGb 761 extract on some of the pathological processes that occur during AD or prion diseases were examined. Although previous studies suggest that the flavonoglycosides had protective properties against oxidative stress in vitro , we were unable to demonstrate a protective effect of myricetin or quercetin against PrP peptides or amyloid-β1-42. Moreover, recent studies reported that these flavonoglycosides have limited bioavailability after oral administration  raising doubts as to whether such compounds are responsible for the protective effects of the EGb 761 extract. In contrast, both ginkgolides A and B prevented neuronal death in response to sPrP106, PrP peptides or to amyloid-β1-42. The protective effects of the ginkgolides were dose-dependent, and both the ginkgolides protected neurons at nanomolar concentrations. Moreover, we found no evidence that the protective effect of the ginkgolide B could be overcome by increasing the concentration of sPrP106 or amyloid-β1-42. In AD and prion diseases the loss of neurons in vivo occurs though apoptosis [3, 20], and although fibrillar PrP/amyloid-β peptides kill neurons in vitro the mechanisms that activate neuronal apoptosis remain unknown. In the present study both sPrP106 and amyloid-β1-42 induced caspase-3, a marker of apoptosis that is increased in murine scrapie  and AD . The presence of ginkgolides greatly reduced the activation of apoptotic pathways in these cells. The presence of ginkgolides also reduced microglial killing of neurons damaged by sPrP106 or amyloid-β1-42. Microglia respond to changes in neurons induced by PrP peptides  and our data are compatible with the hypothesis that pre-treatment with the ginkgolides prevents the PrP-induced changes that activate microglia. It is worth noting that for many Ginkgo biloba extracts, extraction procedures are used that optimise the flavonoglycoside content. However, these procedures may result in extracts that contain different amounts of ginkgolides. Variations in the ginkgolide content of different extracts may be a factor in the variability of results obtained in clinical studies. The ginkgolides inhibit the activity of PAF  that is produced in neurons via the remodeling pathway , and a recent study showed that PAF antagonists protect neurons against the toxicity of PrP or amyloid-β peptides . In the present study ginkgolide treated cells were resistant to the toxicity of PAF as well as that of PrP peptides or amyloid-β1-42. 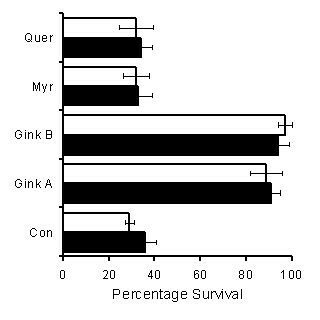 It was noteworthy that ginkgolide B was consistently stronger than that of ginkgolide A, consistent with prior reports that ginkgolide B has greater PAF antagonism than ginkgolide A . Further studies were designed to determine how antagonism of PAF might prevent the toxicity of PrP or amyloid-β peptides. Levels of prostaglandin E2 (a measure of COX activity) are increased in the cerebrospinal fluid of patients with either Creutzfeldt-Jakob disease  or AD . A causative role for prostaglandins in neurotoxicity was strengthened by in vitro observations that neurons treated with COX inhibitors, the enzymes that convert arachidonic acid to prostaglandins, are also resistant to prions  or amyloid-β1-42 . These results are compatible with epidemiological data that show that the use of COX inhibitors reduces the onset and severity of AD . In the present study the addition of PAF stimulated the production of prostaglandin E2 from neuronal cells suggesting that it activates neuronal COX. Furthermore, the ginkgolides reduced prostaglandin E2 production after the addition of arachidonic acid or PAF, as well as in response to PrP or amyloid-β peptides, and cells pre-treated with ginkgolide B were partially resistant to the toxicity of arachidonic acid. These results are compatible with the hypothesis that ginkgolides modulate the COX related production of toxic prostaglandins. It is worth noting that in cell free systems the ginkgolides did not affect the conversion of arachidonic acid to prostaglandins showing they did not have a direct effect on neuronal COX (data not shown). The present study showed that neurons treated with nanomolar concentrations ginkgolides A or B are resistant to the otherwise toxic effects PrP peptides or amyloid-β1-42. This protective effect coincided with reduced neuronal prostaglandin E2 production indicating that neuronal COX was impaired, compatible with previous observations that COX inhibitors protected neurons against PrP peptides  or amyloid-β1-42 . However, unlike aspirin or ibuprofen, the ginkgolides did not have a direct effect on COX enzymes. The protective effect of the ginkgolides in vitro correlated with their ability to inhibit PAF . These compounds also prevented amyloid-β1-42 or sPrP106 treated neurons activating microglia resulting in increased neuronal survival in co-cultures. Recent studies showed that the bioavailability of ginkgolides after oral administration is high , although studies to determine if the ginkgolides cross the blood brain barrier and penetrate the central nervous system are still forthcoming. These results suggest that the ginkgolides have the potential to reduce neuronal loss in prion diseases or AD. However, the processes that underlie neuronal loss in prion or Alzheimer's diseases are varied and more complex than the simple model of neurodegeneration presented here, and further study is required to evaluate the benefits of these compounds. cyclo-oxygenases (COX), a standardized extract of the leaves of the Ginkgo biloba tree (EGb 761), fetal calf serum (FCS), flourometric immunosorbent enzyme assay (FIENA), a peptide containing amino acid residues 82 to 146 of the human PrP protein (HuPrP82-146), platelet activating factor (PAF), cellular prion protein (PrPC), disease-associated isoform of the prion protein (PrPd), synthetic miniprion (sPrP106). This work was supported by a grant from the European Commission (QLK3-CT-2001-00283), the Italian Ministry of Health (RF 2001.96) and the Italian Ministry of University and Research (PRIN 2001). CB was responsible for the conception, planning of performance of experiments, and for writing this manuscript. Both MS and AW contributed to the planning of experiments, interpretation of results and the writing of the manuscript.